Check in time at the Book Nook Inn is 2pm. You can request an earlier check-in, and often it is not a problem. The check out time is 11am, but you are of course free to leave earlier. Eleven am is the time we need access to the room to allow sufficient time to clean it before the next guest arrives. 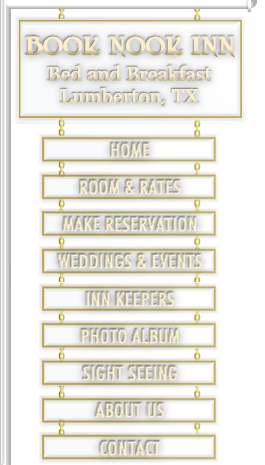 You can, if needed, request a later check out and sometimes it is possible (depends on the expected arrival time of the next guest for that room). Buy flowers or a gift basket from "Flower Delivery" and have it delivered to your room at Book Nook Inn. At Book Nook Inn Bed & Breakfast we rent our rooms by advance reservations. When you reserve a room or rooms we agree to turn away all other requests for the room(s) you reserved. We guarantee to hold the rooms for the day(s) you requested. We want our policy to be fair to you, our guests, yet prevent loss of income to our Inn by cancellations. In the event of cancellation, funds in excess of our initial $35 room deposit will be returned provided we are notified seven days prior to your scheduled arrival date (except for peak Holiday weekends which requires 15 day cancellation notification). Regardless of the reason for cancellation your initial $35.00 room deposit will not be refunded. A reservation made less than 7 days prior to arrival cannot be cancelled. Reservations guaranteed to a credit card are subject to the same terms and conditions as a cash deposit. We reserve the right to process the credit card number for the designated deposit amount and in the event of cancellation or no show for the balance due for the nights booked. Again regardless of the reason for cancellation a $35.00 processing fee will be retained. "No-shows" will be charged for the entire duration of their reservation unless the individual contacts us to explain why they have not arrived. In the event you must cancel your reservation with us, Book Nook Inn requires that all cancellation requests be submitted in writing to the following email address: stacie@booknookinn.com. In the event you do not receive a written confirmation reply back from our office, then your cancellation request has not been confirmed. However your email date stamp will be used to indicate when you made the request. Please call our office directly at (409) 225-9106 for assistance with your cancellation request or if you fail to receive confirmation of your cancellation.